UK2003 has come and gone and now resides in our fondest memories, and in the documentation contained in the links below. Once again, loyal Shutists gathered to tread on hallowed ground; to pay respects to their favorite author; to discuss and honor his work, and to enjoy the companionship of fellow Nevil Shute aficionados. Her Royal Event Manageress, Steph Gallagher, did an outstanding job of planning and managing the event, maintaining the traditions of the Centennial and OZ2001, and setting an example for future International Nevil Shute Gatherings. At the end of the Centennial Celebration in Albuquerque, New Mexico in January 1999, everyone decided it was so much fun that we shouldn't formally close the gathering. Instead, we declared a two year intermission and planned to reconvene in Australia in 2001. That came to pass with OZ2001, held in Frankston, Victoria, in March 2001. Following the established pattern, we again decided not to formally close OZ2001, but to declare another two year intermission and reconvene in the United Kingdom sometime in 2003 instead. Thus, the planning for UK2003 began. Professor David Weir, who attended the Centennial and OZ2001, and presented seminars at both, and his partner Sandra Bower, both of whom live in the United Kingdom, initially agreed to host UK2003. However, shortly thereafter, David and Sandra moved to France, where David had accepted a position with a university. Since we believe that the manager for an event really needs to be a local Shutist, the search was begun for someone to fill in for David and Sandra. After a good deal of soul searching, Steph Gallagher, a UK Shutist, agreed to take over as event manager. Several other Shutists in the UK, Australia, and the US advised and assisted. Now UK2003 has also come to pass. Please refer to the links to the UK2003 Agenda and UK2003 Report for further information on the event. 16:00-17:30 Session 4: David Weir - Nevil Shute, The Typical Englishman or Rogue, Rebel and Marginal Man? or "Cherry Cake, Bungalows and Having Nothing to Say"
NB: With the exception of the Magical Mystery Tour and the Guided Walk, all events were held at the Queens Hotel.. If you have any questions about the gathering, please contact Steph Gallagher directly. 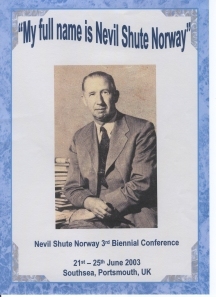 Below is an outline of activities surrounding the organisation, management and content of the 3rd Biennial Nevil Shute Norway Conference, held 21st-25th June 2003, Portsmouth, UK. In addition to this summary, all tools and templates created to help manage processes, plus an electronic version of the conference binder handed to participants, will be archived and made available to future conference managers. Steph Gallagher was appointed Conference Manager in November 2001 and was given only two requirements for the conference. The first was that it had to be in the UK. The second was that it had to involve the consumption of a vast amount of scones and cream! Other than that, she had a free hand. Being that she had not attended either of the previous two conferences; the slate was well and truly clean. Steph started by canvassing the opinions of people who had attended previous NSN conferences and those who might attend UK 2003. She asked for their input as to what they would like to see and hear at UK 2003 and when in the year they would like to conference to take place. Using this information as a base, she compiled lists of potential speakers, venues and places to visit and set a target date for the conference of June 2003. The areas of Southampton & Portsmouth were the first ports of call for potential venues as both are quite significant in the world of NSN. The Queens Hotel in Southsea was found by chance (or divine inspiration from Nevil Shute). It is as Edwardian Hotel, full of character and old world elegance and is mentioned in Trustee from the Toolroom the second favourite NS novel, as voted by NS readers. Other local hotels were also explored and a price comparison was made, The Queens Hotel versus three others. Taking into account negotiations with Queens Hotel Management, they came in as the best option from a financial, location and venue perspective. To be honest, once the Queens Hotel had been found, there was no real alternative. It was decided at an early stage that as much as possible would be done via the Internet and that Nevil Shute website would be used to full potential to advertise the event and form a repository for all information pertaining to NSN UK 2003. To this end it was populated with agendas, registration details, hotel details, transport and tourist information links. The price for the conference was set by analysing AUS2001 costs and factoring; UK administration costs, costs of staging the event at the Queens Hotel, organising an MMT, Opening Reception, Exhibition Hall, Film Festival and Gala Meal. An outline set of accounts will be posted on the web in due course and hence are not included in this report. However entrance fees were designed to be as cost effective as possible as it was not an objective to make a profit. Initially, approximately 150 people had shown interest in attending the conference, approximately 33% of these went on to register for and attend the event. There were 51 paid participants, however not everyone attended every event. An additional half a dozen guests popped in to say hello and we had three additional volunteers who helped everything run along swimmingly. The average age of the 23 female participants was 51, whilst the average age of the 28 male participants was 60. Countries represented included; Australia, France, India, Netherlands, Oman, UK and USA. This day was a frenzy of activity as people started to arrive. Anyone daft enough to offer to help soon found themselves pulled into helping to set up the Exhibition Hall. The Southampton Hall of Aviation very kindly loaned us 8 display panels, each depicting different aspects of life at Airspeed. These were put on display along with Aircraft Models (Courtesy of Gerard Martin & Neil Gaunt), Frances Norway's Flight Log and items from NSN's personal Library (On loan from Dan Telfair), Model of Airspeed Consul (On loan from of Joost Meulenbroek), Model of R-100 (Sourced by Richard Michalak and built & painted by Gerard Martin), NS Book Posters (Courtesy of Dan Telfair), NS Book Display (Courtesy of House of Stratus), NSN Crossword (Courtesy of Jack Calaway), NS Manuscripts - (Courtesy of Dan Telfair), NSN Map of the UK (Courtesy of Alison Jenner), NSN's Pilots Licence (On loan from of Laura Schneider) and NSN Photographic Timeline (On loan from Richard Michalak). The conference opened with Registration and entry to the Exhibition Hall at 13:00. We were extremely fortunate that UK Shutist David Dawson-Taylor had volunteered to help with admin tasks during the conference and had roped in his wonderful wife Kate and friend Yvonne Scott to help with registration and "babysitting" the exhibition hall. All participants registering were given a "goodie bag" containing, conference binder, brochure of Exbury Gardens, guide to Portsmouth, souvenir conference mug and obligatory emergency chocolate. The film festival started at 13:30 with a showing of Crossing to Freedom (4 viewers). Other movies shown in succession on Day 1 were; The Far Country (6 viewers), Landfall (17 viewers) and Lonely Road (8 viewers). Between 18:00 and 22:00 we had an evening reception, which included Drinks and a Buffet meal. This was attended by most participants who took the opportunity to view items in the Exhibition Hall, reacquaint themselves with old friends, and meet new ones. However on reflection holding this at the same time as popular movies forced people to make a choice and there came the dilemma, stay and chat or go and watch a Nevil Shute movie. The audience was split. One possible enhancement to future film festivals might be a speaker introduction at the start of each movie, introducing the movie and perhaps giving a little bit of background about its creation. In addition to scheduled viewing, all films were available for viewing on demand during other activities or during the brief periods in which there were no other conference activities scheduled. On day 2 it was time to get down to business and start with talks about everything Shute. As all sessions were taped for posterity, people were encouraged to use microphones to ensure all voices were picked up. Steph Gallagher started the session by welcoming all participants and reading a special welcome from Heather Mayfield, eldest daughter of Nevil Shute. This was followed by an opening address superbly given by Richard Michalak. After this excitement, it was time to stop for tea and pastries, which was held in the Exhibition Hall, giving people more opportunity to view exhibits and get to know each other. The next talk, given by Fred Erisman, was titled Nevil Shute and the Romance of Work. Fred set a very high standard for all other speakers to follow. His session, along with all following sessions, were a mix of presentation and audience questions & answers. This was followed by a traditional English Sunday Lunch, provided by our venue, the Queens Hotel. After lunch Beall Fowler had the unenviable task of keeping us all awake. 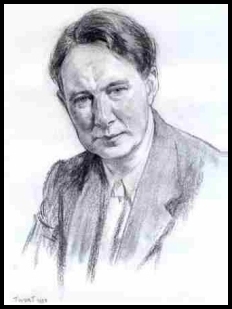 A task he achieved without question with his talk titled; East Meets West in the Works of Nevil Shute. Then it was time for afternoon tea, with long awaited scones and cream. The last session of the afternoon was lead by David Weir, who gave a talk on Nevil Shute; the Typical Englishman or Rogue, Rebel and Marginal Man. After a short break, people were invited to join Gerard Martin who led an excellent walk of Southsea, which included a view of 14 Helena Road, the Southsea home of Nevil Shute Norway. During the evening the Film Festival was still in full swing, with viewings of No Highway in the Sky (8 viewers) and On the Beach, (5 viewers). Day 3 was kicked off by Laura Schneider and a talk about: Legality vs. Morality; the Integrity of Nevil Shute and his Characters II. As with all sessions, this was followed by Tea and pastries in the Exhibition Hall. We were then treated to a very informative talk by John Anderson on Nevil Shute's Engineering. This was followed by lunch at the hotel. After lunch we were superbly entertained by Richard Michalak and his talk on Reality and Recurring Themes within Nevil Shute "or" Cherry Cake, Bungalows and Having Nothing to Say. The afternoon tea break brought scones and cream again. After this Margo Ganster gave a talk on behalf of Zia Telfair on The Appeal of Nevil Shute. Day 4 was rather special as it bought out Magical Mystery Tour. Why call it a "Magical Mystery Tour"? At the time of planning the event, a full agenda for the day had not been determined, hence the mystery. As for magical, well, any tour that is a combination of the wit and enthusiasm of 50 or so devoted Shutists, combined with visits to places associated with Nevil Shute Norway, must be rather magical. David Dawson-Taylor had very kindly offered to give a running commentary on our tour. We started with a drive through Southsea and Portsmouth to the old site of Airspeed, where several hangers are still standing. This was followed by the first stop of the day, which was Pond Head House on Hayling Island, where Nevil Shute lived with his wife and two daughters from 1941-1950. Morning tea was held at the "Ship Inn" at Langston, overlooking the mill once owned by Flora Twort. We then took the scenic route to our lunch spot, Exbury Gardens, via Leap. At Exbury Gardens, we were joined for lunch by Mr Eddie and Mrs Anne de Rothschild, current owners of Exbury House and Gardens. After lunch we were treated to a guided tour of the 220 acre garden. For ease, we were split up into three groups. The first Group was lead by Mr Eddie's son Mr Nicholas de Rothschild, who by all accounts gave a very animated commentary on various points of interest. The second group was lead by Mr Angus Harley, Agent to Mr Eddie. The third and probably most fortunate group comprised a select few who were invited to climb aboard Mr Eddie's electric buggy and view the gardens in style. It is reputed that this select group were also treated to a ride on the Exbury train which powers its way round a portion of the garden. The fun did not stop there as we were then treated to afternoon tea in the grounds and parlour of Exbury House. Here we were joined by Mr Leo de Rothschild, who witnessed the shooting down of the Ju188 on 17th April 1944 and gave a stirring account of events. Mr John Stanley, was also present and read extracts from his soon to be published book, which will include a chapter on the bomber crash. Also in attendance were members of the Exbury Veterans association, Marion & Stuart Loveland and Peggy Mead, who also contributed significantly to the success of our day and were happy to answer questions we had about Exbury during the war. All good things must come to an end; at 5pm it was time to head back to the hotel to get ready for an evening of fun and festivities. The fun and festivities came in the form of our Conference gala Meal. This started with Pimms (a traditional English summer drink) on the hotel lawn. This was followed by a three course meal with liqueurs. Then we were treated to a rousing after dinner speech and poem presented by Her Worship Fran Kilgariff, The Mayor of Alice Springs. At midnight the hotel staff sent the last few party stragglers away so that they could prepare the room for the final day. Day 5, last but not least. David Vaughn started the day continuing with the high standard of presentation set by Fred Erisman, with his talk on The Role of Barnes Wallis in the Writings of Nevil Shute. This was of course followed by the obligatory tea and morning pastries. Shoshana Milgram Knapp kept us entertained after tea with her talk on Nevil Shute's Writing: An Admirable Style, leading us into a lunch break. After lunch we had the last, but by no means least speaker of the conference, Dan Telfair who presented on; In search of Nevil Shute. After the final tea break, and scones & cream of the conference, Steph Gallagher led the final session, which she titled a "Cornucopia of Delights". This session comprised a mix bag of thank you's, especially to David-Dawson Taylor for all his help and support during the conference, discussions on venue for NSN 2005 and the Nevil Shute Norway scholarship programme. There was also an opportunity for audience to participate by raising any issues for comment or discussion. Before we said our last goodbyes, Dan Telfair presented Steph Gallagher with an enormous bunch of flowers and a very attractive framed painting of The Mill, once owned by Flora Twort. He had purchased the painting only the day before at the morning tea stop, with the ink still wet from the painters brush. Steph Gallagher ended the session and the conference by wishing everyone well and adieu till 2005. Post conference activities comprised; Thank you letters to The de Rothschild's at Exbury House, Mrs Robertson at Pond Head House, Southampton Hall of Aviation who leant us several display panels for our Exhibition Hall, The Mayor Alice Springs and several other noted individuals who helped the conference become a reality. The post conference report has been written, files tidied and final conference accounts are being completed. Investigations are also being conducted into the feasibility of producing multiple sets of conference tapes for sale. Richard Michalak is creating a conference Photo Album, a copy of which will be posted to all participants. Steph Gallagher will also perform some post conference follow-up with participants to ascertain if any learnings can be gained from the management and content of the conference. NB: It was never my intention to make a profit out of UK 2003. Finances were calculated almost to the last penny. The £407.27 excess comes from one registration during the conference (£300), plus extra income from mugs and finances from two sets of tapes paid into the UK bank account. After discussions, it was decided to retain the £407.27 excess in the UK to help fund the UK branch of the NS library and other UK based activities. What was your overall assessment of the organisation of the conference out of 10? A fabulous event, like the best sort of party. Well done! Is there anything you would have changed about the organisation of the conference? What was your overall assessment of the Registration Pack out of 10? Is there anything you would have added, or left out of the Registration Pack? Didn't need Chocolate, but my Daughter thought it was a good idea! What was your overall assessment of the length of the conference out of 10? What was your overall assessment of the Queens Hotel out of 10? (Please take into account Bed & Breakfast rate, Quality, Food, location, friendliness and helpfulness of staff). What was your overall assessment of content of the speaker presentations out of 10? What was your overall assessment of quality of the speakers out of 10? What was your overall assessment of format of speaker presentations, (presentation then Q&A session) out of 10? What was your overall assessment of the length of each session, were they too long, too short or just the right length? What was your overall assessment of content of the Exhibition Hall 10? Outstanding, spectacular! Much higher than a ten! It was informative, fun, well laid out, chock full of information many didn't know we wanted to know, lots of "hands on" items (books, models, etc) to examine and just TOUCH! Is there anything else you would have liked to have seen in the Exhibition Hall? Yes, something about model engineering! Gosh, I don't know what else is there about NSN!!!! What was your overall assessment of the Film Festival out of 10? I only saw 2 movies (parts of both) because the room was (happily) crowded. 'In fairness, it wasn't my favorite part of OZ2001 for the same reason. The room wasn't great for this sort of thing. Under the circumstances, both were done as well as the environment allowed. There are many films I still want to see but in a different (ok...better) room. Frankly, I don't that there IS a better way to show them. Showing them at all is the biggest coup and it is a vital part of the Conference! They must be part of the Conference!! Is there anything you would have changed about the Film Festival? What was your overall assessment of Guided Walk of Southsea out of 10? My overall assessment of the Guided Walk was that it worked very well and that everyone who attended seemed to enjoy it, although my legs creaked for a week afterwards!!! 10 I thoroughly enjoyed it, excellent commentary and itinerary by Gerard and the pace was just right. A good chance to get in some chat with other participants on the way back. Is there anything you would have changed about the Guided Walk of Southsea? What was your overall assessment of the Magical Mystery Tour out of 10? Is there anything you would have changed about the Magical Mystery Tour? We should have had community sing in the bus "Bluebirds over the White Cliffs of Dover" "A nightingale sang in Berkeley Square", the theme from Dad's Army "Who do you think you are kidding Mr Hitler"
What was your overall assessment of the Gala Meal out of 10? Table mates 100% Gallantry of neighbouring gentlemen (Richard & Jack) infinity and Beyond! Is there anything you would have changed about the Gala Meal? NO!! It was superb! Dinner was lovely and the Cognac and Port served at the end of the meal was a very lovely touch (so was the chocolate and the EXTRA chocolate they brought us). It set the perfect tone for Her Worship's Speech! Do you feel that overall the conference was good value for money? Overall excellent. Initially I thought this was a little high, however with the continuous hot and cold running food and even drinks on the first night, the coach tour etc. I am impressed how it was done for the money. Even my wife was impressed when she heard what was included. But then she regarded it as worth every penny to get rid of me for 5 days! Would you have preferred a cheaper conference, but without extra bits, such as gifts, scones & cakes, more basic hotel? I would prefer fewer frills at less cost! What was your highlight of the conference? Hard to say. Meeting people and evoking the spirit of Shute. The excellent talks. The exhibits, the tours. Highlights. One meeting fellow Shutists and the other Exbury. The visit to 'Mastodon' but mainly because Wren is my favorite book! With the exception of Nevil Shute Norway, is there anything that you feel was missing from the conference? Can't think of anything, except perhaps a fly past of an Airspeed Oxford! Are there any other comments you would like to make about the conference? I thought the whole conference was very well put together. I have no complaints or suggestions. I hope Seattle will be as good! I want to thank YOU for the time, detailed thought, energy, passion, time, brain cells, energy, time, chocolate and everything else I can't think of right now for agreeing to tackle this immense undertaking. Your thought, extreme care, HUMOUR and attention to details and comfort went above and beyond anything imaginable. The fact that you were new to this wacky band of Shute fans made it all the more extraordinary. You were able to handle the wild, the wacky, the mad and the meddlers with grace, dignity and a gentle but firm hand while never losing your sense of humor! BRAVA!!!!! Lovely event that benefited tremendously from all of the advance planning and effort on the part of you and your helpers - very much appreciated by all who attended! Admirable! Beautiful! Charismatic! Delightful! Eventful! Fantastic! Great! Humungous! Inspirational! Jubilant! Kaleidoscopic! Lovely! Meaningful! Noteworthy! Opulent! Popular! Quintessential! Regal! Superlative! Terrific! Unbelievable! Valuable! Wonderful! Xtraordinary! (OK - I cheated on that one) Yummy! Zealous! What was your MAIN reason for not attending UK 2003?